Help California Fight for the Environment in 2019! With energetic environmental leader Governor Gavin Newsom in office and strong pro-environment majorities in both the California State Senate and Assembly, California is starting 2019 off strong! State Senate leader Toni Atkins has already introduced a landmark bill — SB 1 — which would help safeguard clean air, safe drinking water, and endangered species protections within California, even when the Trump administration weakens them at the federal level. We must show our support for SB 1 and for other strong legislation to help fully realize our 100% clean electricity goal, promote cleaner transportation and livable communities, reduce health threats from toxic chemicals, and safeguard residents from destructive wildfires made worse by climate change. 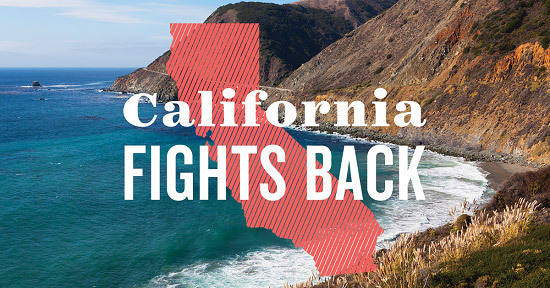 Tell Governor Newsom and your state legislators that you’re counting on them to keep making California a national leader on fighting climate change, protecting our environment and public health, and resisting the Trump agenda. Dear Governor Gavin Newsom and California State Legislators: As your constituent, I want to welcome and thank you for starting off 2019 strong, and express my support for action on climate and environmental and public health protection. I’m inspired to hear about the introduction of SB 1, by Senator Toni Atkins — a landmark bill that would help defend clean air, safe drinking water, and endangered species protections within the state, even when the Trump administration weakens them at the federal level. I urge you to support SB 1 — and to help ensure that this critical bill becomes law. I also urge you to advance policies to: * Help realize California’s 100% clean electricity goal * Protect Californians’ health and environment from the increased production and transport of heavy oils, such as tar sands * Reduce climate pollution from transportation (the top source of climate pollution in the U.S.), improve transportation and land-use planning, and build more affordable, transit-adjacent housing * Protect Californians from toxic chemicals by eliminating the use of chlorpyrifos, a toxic pesticide linked to learning disabilities, ADHD, and permanent brain damage in children * Ensure the safety of consumer products sold in California * Strengthen water efficiency, improve drought resilience, and ensure that all Californians have access to safe drinking water * Dedicate resources to preventing and fighting future wildfires across the state * Protect the California desert from destructive groundwater extraction projects I’m proud of California’s bold leadership — which is needed now more than ever — to stop the Trump administration’s reckless actions at the federal level. I’m counting on you to help secure a clean and healthy California that will enhance our state’s prosperity and build a bright future for our children. Thank you so much for your time. Enter mobile number to receive urgent action and breaking news alerts to your cell phone. We will send you 3-4 texts per month; msg & data rates may apply; text STOP to quit anytime, HELP for more info. Yes, I agree. Keep me updated with emails. I do not agree, and unsubscribe me from your mailing list. Take action and the NRDC Action Fund will keep you in the loop on how to defend our environment from Trump and his fossil fuel allies in Congress.